Grevillea ‘Evelyn’s Coronet’ is a hybrid whose parents are thought to be Grevillea buxifolia and Grevillea lavandulacea. The hybrid arose in a Lane Cove, Sydney, garden in 1972 and was registered in 1976. The name refers to the name of the owner of the garden and the rather regal, crown-like flower heads. Grevillea ‘Evelyn’s Coronet’ is a rounded shrub that reaches a height of two metres in our cold climate garden.The narrow-oblong leaves are about 20 mm long with turned-down margins. The crown-like flower heads are carried upright on the ends of branches. They are woolly, greyish-pink with bright pink styles. 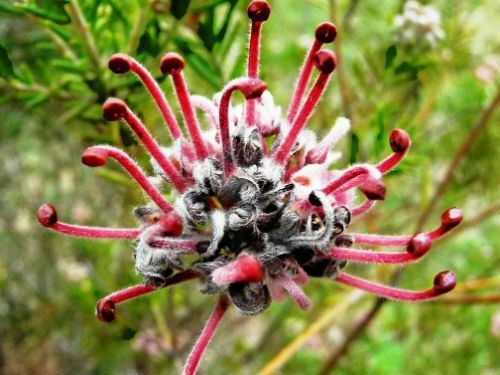 The flower shape and to a certain extent the colour are reminiscent of Grevillea buxifolia blooms. Flowers are both conspicuous, profuse and carried through spring and summer. We find this hybrid to be hardy, free flowering and certainly easier to grow than Grevillea buxifolia in our cold climate garden. Pruning keeps our plants compact and blooming bounteously.